Today we're joined by Andrew and Neil from Indietracks veterans The Felt Tips. According to the band, they formed in summer 2006 when two kites became entangled with each other on Largs Beach just outside Glasgow. We can't wait to welcome them back to Indietracks this year! Andrew: We've been playing as The Felt Tips for 4 years now. In late 2005 I had given up hope of forming a band in Glasgow and had become a bit of a hermit, recording songs in my bedroom and putting them online for everybody and nobody to hear. Then one day some Spanish guy (Miguel) phoned me after finding an old advert I had left in a music shop. He had recently moved from Spain partly because Glasgow was one of his favourite cities for music. I said I wasn't interested in starting a band any more. I'm now very grateful that he persevered and managed to convince me to meet up to play some music together. Turns out that we clicked and soon we were planning forming a band. I got my childhood swee... I mean friend (!) Neil to play bass for us, and then drummers came and went until we found Kev two years ago. Now we all get along terrifically and (touch wood) we seem to have mastered the art of endlessly arguing without falling out with each other. 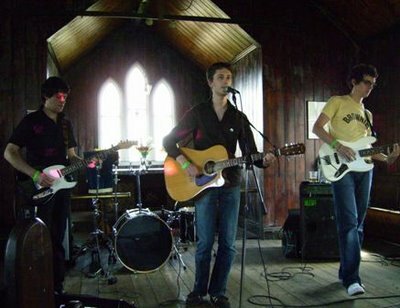 We were actually the first ever band to play Indietracks. It was in the church and we didn't have a drummer so the gig had an 'unplugged' feel about it, especially since the congregation were listening so attentively. In a way, getting to play Indietracks launched our international indiepop career. Being on the bill brought us to the attention of Cloudberry Records and La Merienda (a brilliant Spanish indiepop radio programme), two of our greatest supporters over the years. After a slight blip when we had no regular drummer for a year we are about to release our debut album. We absolutely love the record ourselves and can't wait to share it. Hopefully it will be out very soon. Anyway, we are genuinely dead excited about returning to play Indietracks. If you live near Cardiff or London you may also want to catch us at the Indietracks warm up shows in those cities. Tell us something unusual about yourselves..
Neil: Kev has the same name as an infamous local Glasgow gangster which can cause a bit if confusion (especially when he was shot dead a few months ago). Miguel often plays with Sebastian of Cineplexx (although we think they should form a B&S covers band called Miguel and Sebastian). Neil has a fine collection of retro NHS glasses (one of which is believed to have been owned by Morrissey). Andrew has a tongue that is so long and mobile he can swallow it and pick his nose with it, and even play some guitar solos with it! Hmm, sounds interesting! Ahem. So...what's going to be on your compilation tapes as you travel down to Indietracks? Andrew: It'll probably be some jangly guitar bands from the past won't it? Maybe one of the band will surprise the others and bring along the newest Kelis record. Andrew: All the bands we have never listened to before. Thanks Andrew and Neil! Look forward to seeing you in about, ooh....eight weeks time!